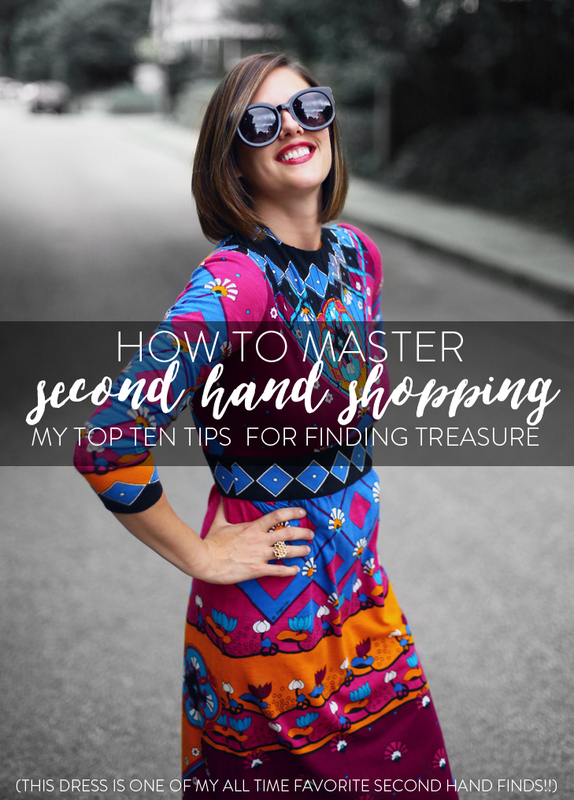 One of my favorite things to do is shop second hand. I brake for yard sales and I haunt Goodwill. This summer I’ve had some great luck so I’m going to pass on some of my top tips to make the most out of your digging. In my mind, I have a short list of items that will work for my home or my closet. My current rundown is something like this: wooden vessels, oil paintings, cake stands, midcentury furniture, globes, lamps, quilts, vintage sheets and vintage home goods. For clothing I quickly scan the skirt and dress isles for quality fabrics or interesting prints - I don’t go hanger by hanger. Leather, wool and denim are top of mind, but if I see something that’s definitely vintage, I take a closer look. I know exactly where these items are located in my local thrift stores so I hit those areas up first. If you go in with a set picture of something you saw online or on TV, it can be really hard to find the same thing. Be open minded to your categories. I always give myself a mental maximum price before I check out the actual tag. This can be a helpful tactic when shopping off price places like Marshall’s or TJMaxx too. Sometimes a brand name tricks you into thinking you’re getting a good deal, but if you don’t need/want it in the first place, who cares if it’s Kate Spade at 70% off. Do a once over on all clothing to look for holes, tears or stains. Some things may wash out, but some will not. Ditto for furniture. You can quickly get an idea if you’re going to find something at a good price by checking out a few items. Some people want the moon for their junk and that’s fine! It’ll be a treasure to someone, but not me. When this happens, I say thanks and keep moving. This really only works at yard/garage sales, but if you buy multiple pieces sometimes you can just round down to your nearest bill. “Can I make it $10 for these few things?” You can also say “I was thinking a little less on this… what’s your best price?” You can also ask for a little better price if something is damaged. Deals get better at the end of the day/weekend. If you love something but have a budget, it’s ok to let the seller know. Just don’t be insulting with the discount - no more than 30%. Also don’t take it personally if the seller isn’t willing to make a deal. Some junk sellers are just crabby. If you think you’re on to something good and it’s a little pricey, do a quick search on ebay or etsy to find out what the going rate is. My all time best buy was a full set of china for… $3.50. I asked if it was for each place setting and the woman running it said “Nope, the whole box!” I took a pause and pulled out a fiver. Then speed walked to my car with my haul! Lesson - don’t get too excited when you find something amazing - and don’t set it down until you’re sure you don’t want it! I take both of my kids shopping with me and usually get an hour or so per day we go out. Felix knows he will get a quarter to buy candy and sits in the cart to slowly eat it. Our other rule is “no touching - keep your hands in the cart.” With Beatrix, I just make faces at her or wear her in a baby wrap. I also plan my trips when we’re not too cranky/whiny/hungry/tired. If I have to leave because they’re crying or screaming - I just do it!! Although - that doesn’t happen very often! Finally - follow your gut. If you love it and it feels right - buy it! At the very worst you can re-sell it at your own garage sale down the road!